Violet Intrigue is a mid-sized selection of English lavender, growing to about 2' tall with the flower spikes and 2' wide. It forms a tidy, dense mound of narrow, soft, greenish-silver leaves that are particularly aromatic. The flower spikes are about 2" long and dark violet. Violet Intrigue is a mid-sized selection of English lavender, growing to about 2' tall with the flower spikes and 2' wide. When not in bloom, the mound of foliage is about 15-18" tall when the plant's fully grown. Violet Intrigue forms a tidy, dense mound of narrow, soft, greenish-silver leaves that are particularly aromatic. It produces masses of violet flower spikes that are about 2" long and bloom in early to mid-summer. 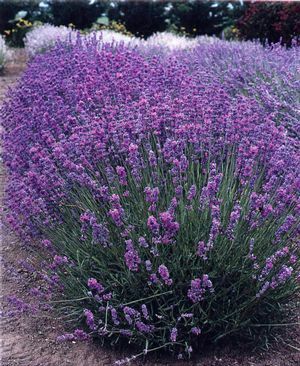 Lavender needs good drainage and won't thrive in wet heavy clay soils. It also needs at least half a day of sun otherwise it'll grow too leggy and floppy. Violet Intrigue's drought tolerant once established. Violet Intrigue works really well as a low-growing hedge lining a path or mass-planted on banks. It's relatively compact size makes it a good choice for smaller gardens and median strips. Lavender is an excellent bee and beneficial insect attractant. The flowers can be cut to make fragrant bouquets, either when they're fresh or when they're dried. Plants should be sheared lightly in summer after the flowers have died, or in early spring before new growth starts. I always suggest cutting off at least an inch (2.5cm) of the leafy stems as well as the flower stalks. This will help the plant stay nice and bushy and stop it becoming bare-leaved at the base. Violet Intrigue was bred by Virginia McNaughton of Lavender Downs in New Zealand and has plant patent number USP#15344. Unlicensed propagation for commercial purposes is prohibited. Registered with COPF.